What does "when pigs fly" mean if pigs can't really fly? 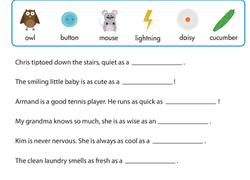 Kids use context clues to learn the meanings of common idioms on this year four reading worksheet. Use this resource with your students to practise using context clues to determine the meaning of idioms. As quiet as a mouse or as quiet as a cucumber? Kids will learn the definition of a simile, then use pictures as clues to complete the similes. Alliteration is a type of figurative language that is often used in poetry. Use this classic poem with your students to practise identifying alliteration in context. Use this worksheet to teach your students to write compound sentences with the support of sentence frames as they differentiate between literal and nonliteral meanings of idioms. Don’t forget the context clues! Use this worksheet to teach your students how to explain the meaning of literal and nonliteral language. Don’t forget the context clues! Your students will infer the meaning of unknown figurative language examples by using context clues. Learn what an idiom is, and do some fun coloring with this informative worksheet. Use this resource with your students to practise using context clues to find the meaning of nonliteral language. What in the world? Your students will have a blast unpacking the meaning of common idioms and creating original art as they learn the difference between literal and figurative interpretations of sayings. This exercise will get your students inferring the meaning of unknown metaphors. Successful students set sail with alliteration! Use this resource with your students to practise writing sentences using alliteration. 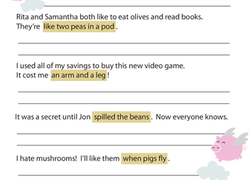 Introduce your students to these common English idioms, used in the context of a sentence. Introduce your students to some common English idioms and their meanings. Alliteration is a type of figurative language that is often used to engage a reader’s senses. Use this resource with your students to practise identifying examples of alliteration in context. This worksheet is a beast! That's a metaphor, and your child will be writing his own metaphors in no time, then he can use them in a poem. Silly sentences will have your students smiling! Use this resource with your students to practise writing silly sentences with alliteration. Hot potato! Here's a fun worksheet that is sure to elicit some giggles. Students will sketch the literal meaning of three idioms.